FineCraftGuild is the site where I’ve shared 1500 creative ideas that have dazzled me or that bubbled up in me over the last 10 years. Now, I focus on patterns, but there is so much more under the hoot. 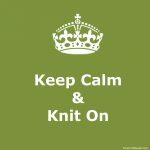 Hence my new tag-line: knitting & more. FineCraftGuild aims to be ‘the destination-blog’ for easy, eco-friendly DIY Crafts & Home Décor tutorials & patterns. It takes inspiration, research, experimentation, practice and time to raise a creative project from ‘good’ to ‘great’. We present easy, inspiring and green how-tos, tutorials and patterns. And we offer extensive input on what works and what doesn’t. This way, we help readers create craft, DIY and decor projects better: simple, economical, beautiful, trendy and eco-friendly. [.. READ MORE: Mission Statement]. With 1400+ free craft tutorials and more in the pipeline, we currently host and reference plenty of tutorials and training materials on site. However, if you want help with any other particular project, send us an email: contact (at) FineCraftGuild.com. Our readers are women who pursue creative projects. They have an eye for the beautiful, unique and trendy. However, many are moms and have busy schedules. Hence, they need projects to be achievable, practical, economical, … and eco-friendly. [.. READ MORE: Readers & Advertising Opportunities]. Begin 2014, we counted that about 40% of the projects at FineCraftGuild.com use recycled craft materials in articles. We aim to strengthen that green focus by writing more and more about recycled crafts & eco- green DIY decor ideas throughout 2014 and beyond. New materials suggested are usually logical choices, such as in the case of ingredients in food recipes. 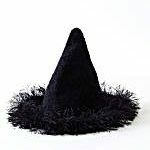 Often though, FineCraftGuild.com suggests readers to first check what already have in their home before purchasing new craft supplies. Our philosophy is to make the world a happier and greener place: thus: re-purpose, ‘make do with what you have’, and buy only what is necessary to make projects fabulous. “As Fine Craft Guild’s Editor, I write this blog under the name of Rose. The ‘Rose’-persona in me lives like an artist, and embellishes pretty much everything in sight. My home is filled with art, crafts and DIY projects. Travelling is part of my life. Compared to most people, I travel lots and lots! To far and obscure places in The Netherlands, France (Paris! ), Italy, Canada and the US and, most recently, London, England. Besides bringing clothes home, I fill my suitcases with fun, decorative and often ‘a bit crazy’ items. You could call them ‘souvenirs’. You can find kitchey aprons from Rome, recycled felt flowers from the US, handmade jewelry and paintings from Canada, vintage table cloths from Italy, soap molts and scrapbooking stamps from China. Over the years I collected stacks of beautiful fabric found on those wonderful Dutch outdoor markets. And the happiest-colored high quality mercerized yarn from Dutch knitting shops, which are just the best stocked in the world, in my opinion. I also tend to create art projects when I travel. For fun. Some of these may be transient but often ‘something’ from that art experience comes home with me. Even just a photo. Like this sand-tray circle-of-friends. I found this tray with sand somewhere in a shed outside a restaurant somewhere in a seashore village, just North of San Francisco. 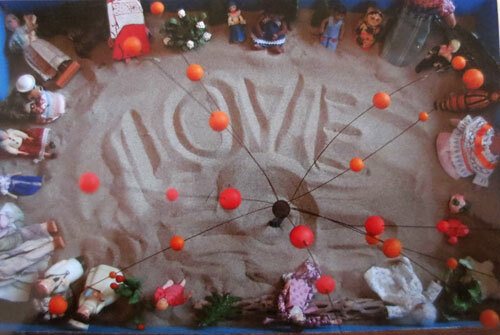 I poked around the sand with my finger…Then I decided to create a circle of friends, and put love in the center. Now, do you want a tutorial for this? Possibly not. However I had fun creating this setting, just for a photo…. Am I crazy? I paint. In acrylics, but I don’t write much about this on this blog. Making art is one of those things that I don’t want to teach, but do. But it is here, and no doubt influences my sense of color, composition, etc. in my projects. But mostly, it makes a gigantic mess in my house. Which is why you don’t see a complete house tour, perhaps. (confession… sorry). I think I have landed in the world from pastels, after a decade of bright full-color artwork. 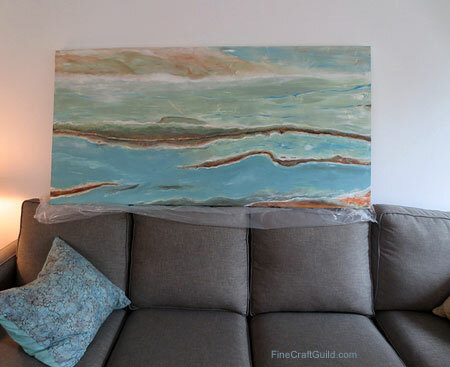 Here’s the latest abstract painting that I just made for my friend in Canada who wanted just that: a pure abstract made with the colors of her new sofa, her flooring, her dining room chairs and those lovely turquoise and blue hues that she likes. And there it is. It’s huge! 60 x 24″. Like it it too? She’s happy with it, that’s the main thing. Want a tutorial or tips on how to make your own loft artwork? Or commission an abstract artwork for your living room? What I do write about is …. everything else craftsy and creative! I love restyling fashion, and make something out of ‘nothing’. I like making cards and bake with kids. 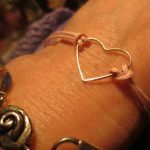 And loves bead jewelry, making necklaces, bracelets, etc, to complement my growing range of handmade knitwear and crochet clothing. And I write about all this. I learned knitting as a teenager, but my passion for crochet is only 5 years old. These are some of the flowers that are on my craft work table. Actually, they are several projects combined. The rounds were meant to become a crochet girls cardigan. 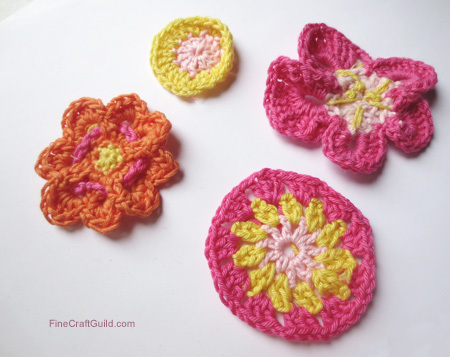 And the pretty crochet flowers, well, they go with just about anything under the sun. Right?! Beyond Rose, we feature guest writers – artisans from all over the world, covering all kinds of different crafts. They are people who love to create DIY, Crafts & Home Décor, and have a keen interest in eco-friendly designs. We’ve had two regular guest writers. Janeen van Niekerk, who lives in South Africa, loves paper piecing and Quilting. Every Thursday she features a free post with what started as tips for beginning quilters, and has evolved in a series of free online workshop for easy quilt projects you can do on your own with her detailed, illustrated instructions. When she’s not on our blog, you can find her quilting at www.quiltartdesigns.blogspot.com, wheres she shares her quilting adventures. 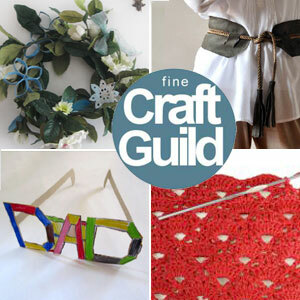 Mondays, the wonderful Tammy Henderson, a natural home decorator has been coming to Fine Craft Guild. Tammy is incredibly creative. (She used to own a craft shop….) Her weekly illustrated tutorials feature DIY beautiful seasonal arrangements that use recycled materials’. Her photos are stunning. 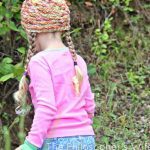 They make you overlook that she typically uses mere dollar store trinkets, cheap vintage finds, recycled materials and free garden clippings. 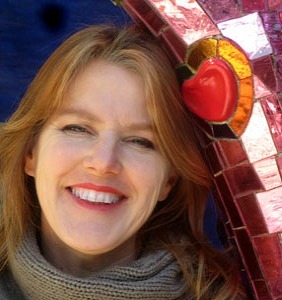 Beyond our weekly feature, Tammy writes every day at her beautiful blog OneMoreTimeEvents.com. Who else? Occasional writers are active crafters, jewelry makers, quilters, seamstresses, crochet-ers, knitters, home decorators, renovators, furniture DIY-ers, upcyclers and other artists. We share DIY & craft tutorials, tips and techniques on this blog. We feature what inspires us! Last but not least, behind the scenes at FineCraftGuild.com we have a guy dubbed ‘Michael’. He is the technical to-go-to guy. From time to time, he’ll featuring ‘manly’ DIYs. Third parties may be placing and reading cookies on users’ browser, or using web beacons to collect information, in the course of ads being served on this website. Please Google the latest, most up-to-date information about your user options for cookie management. Our articles contain affiliate links. We often make recommendations for products we believe in and will earn an affiliate fee if you were to buy them. We do however sincerely recommend them. We hope you will use these links to purchase your craft materials. Earning little fees for each sale helps to maintain this blog. There are also advertisements on this site. We will receive a small return if you were to click on these image-links. All these little amounts have helped us to pay expenses and keep Fine Craft Guild alive. To more successfully manage this blog and several other websites in specific niche markets, e.g. by sharing cost of shopping carts and other blog management software, a few years back we set up a little company called Aryta. So, in the paperwork you’ll find that FineCraftGuild.com is now owned and operated by Aryta Ltd, registered at 1 Rosemont Road, London NW3 6NG, England.